Humans automatically categorize others in social perception. Some categorizations ­ race, gender, and age -- are so automatic that they are termed "primitive categories." As we categorize, we develop stereotypes about the categories. Researchers know much about racism and sexism, but comparatively little about prejudice based on age. The papers in this issue highlight the current empirical and theoretical work on understanding the origins and consequences of stereotyping and prejudice against older adults. With the aging baby boomer demographic, it is especially timely for researchers to work to understand how society can shed its institutionalized ageism and promote respect for elders. Todd D. Nelson is the Gemperle Foundation Distinguished Professor of Psychology at California State University - Stanislaus. His research focuses on the impact of ageism on older persons. Specifically, he is interested in understanding and how age prejudice, stereotyping, and discrimination at the individual and societal level influence how older people feel about themselves and the future. Ageism: Prejudice Against Our Feared Future Self. A Terror Management Perspective on Ageism. Attitudes Toward Younger and Older Adults: An Updated Meta-Analytic Review. This Old Stereotype: The Pervasiveness and Persistence of the Elderly Stereotype. Ageism and Ageist Language Across the Life Span: Intimate Relationships and Non-intimate Interactions. Re-Vision of Older Television Characters: A Stereotype-Awareness Intervention. Perceiving Age Discrimination in Response to Intergenerational Inequity. The Social Separation of Old and Young: A Root of Ageism. Models of the Aging Self. 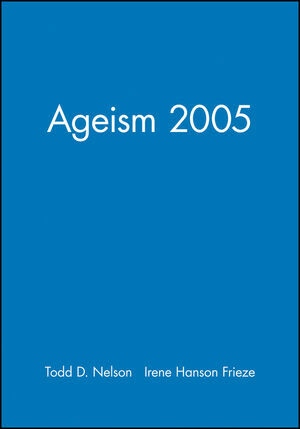 Ageism Across the Lifespan: Towards a Self-Categorization Model of Ageing.